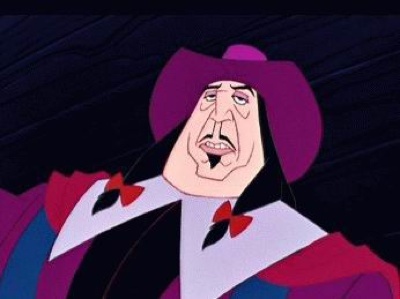 What makes a Disney villain? Disney villains often come to represent what is outside of the norm, whether these be gender norms, racial norms, or cultural norms and send the message that different is evil. 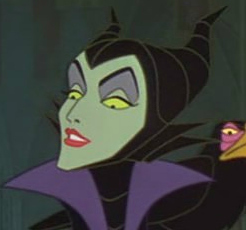 Many of the Disney villains exhibit appearances that are both masculine and feminine, giving them a transvestite appearance. 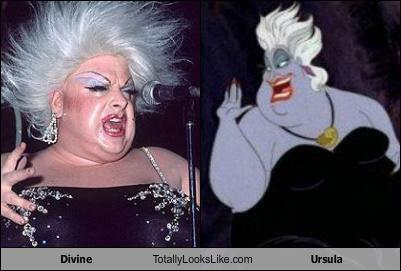 This theory is most strongly supported by scholars who point out that Ursula was modeled after a famous drag queen Divine, pictured below. If there’s one thing that supports this drag queen imagery, it’s the amount of makeup that is caked on all of the Disney villainesses. No matter the occupation (sea-witch, evil queen, stay-at-home mom) they all have arched eyebrows that look penciled on, painted lips, and globs of eyeshadow. However, these strangely masculine females are more than just based on drag queen images. 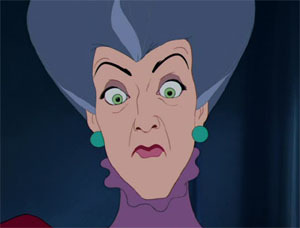 Several aspects of many of the Disney villains and villainesses are representative of both genders. For example, as discussed earlier in this blog, many of the female villainesses tend to have many masculine aspects to their appearances. These include both masculine body shapes, lack of feminine flowing hair, and angular faces with more square chins. 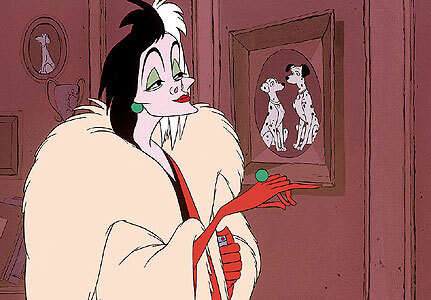 An example of this is illustrated below in the still of Cruella DeVille. She exhibits both the “drag queen” elements such as arched eyebrows, heavy colored eyeshadow, and red lips, but also has masculine aspects including a curveless body (not pictured), jagged short hair, and a square skin. The men also tend to appear as “prissy.” For example, Governor Ratcliff wears bows in his hair, a clothing accessory associated with women. Not only that, but he wears his hair in “pig tails,” a hairstyle that is worn almost exclusively by girls. Male villains also have dark shadows over their eyelids that look like eye shadow and occasionally have pronounced lips that are highlighted by a darker color reminiscent of lipstick (Hades, Captain Hook, Dr. Facilier). 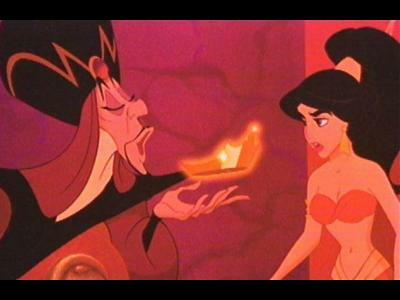 Note how feminine Jafar appears in the still below. His eyes are clearly dark and he even has eye liner and accentuated eyelashes. The way his lips are drawn also makes him look more feminine. The male villains also have longer hair than the typical male love interests or protagonists. Shan-Yu, Governor Ratcliffe, Gaston, and Captain Hook all have long hair that either flows freely or is loosely tied. 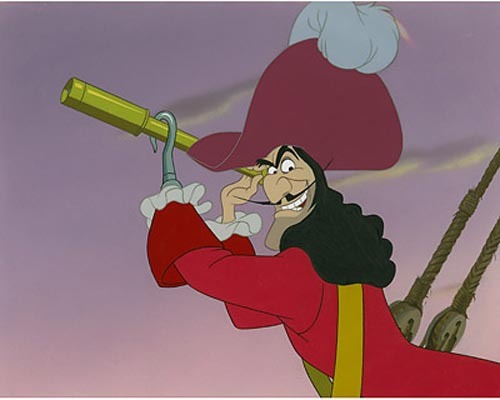 Below, Captain Hook’s masculine features (five o’clock shadow, mustache) are balanced by feminine features (long flowing hair, arched eyebrows). Once again, Disney teaches the norm is upheld by heros and that the villains represent the other. Whereas Disney protagonists follow clear gender roles and are clearly either feminine or masculine, the Disney villains and villainesses exhibit the physical attributes of both men and women.